This post is sponsored by the Colorado Springs CVB. Visitors’ to Colorado Springs can fly into the local Colorado Springs Airport, or if you prefer to road trip your way across the country it makes one heck of a beautiful drive. It doesn’t matter how you get there, Colorado Springs is the most inviting outdoor adventure destination you could imagine. And in the fall, Colorado is bursting with gold as far as the eye can see. 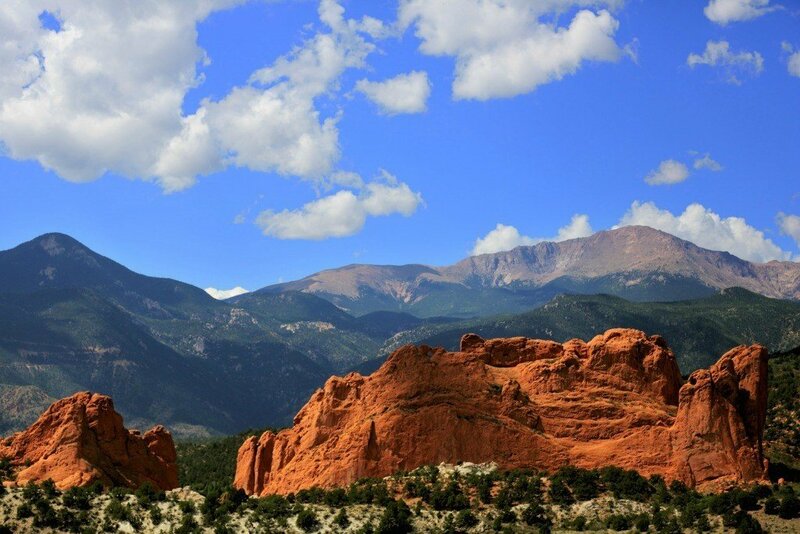 Today, I’m sharing why Colorado Springs should be on your bucket list and why it’s on mine. In this crazy, hustle and bustle world that saps your energy with the 24/7 overload of demands, it’s important to unplug, unwind and take some time out to recharge your batteries. 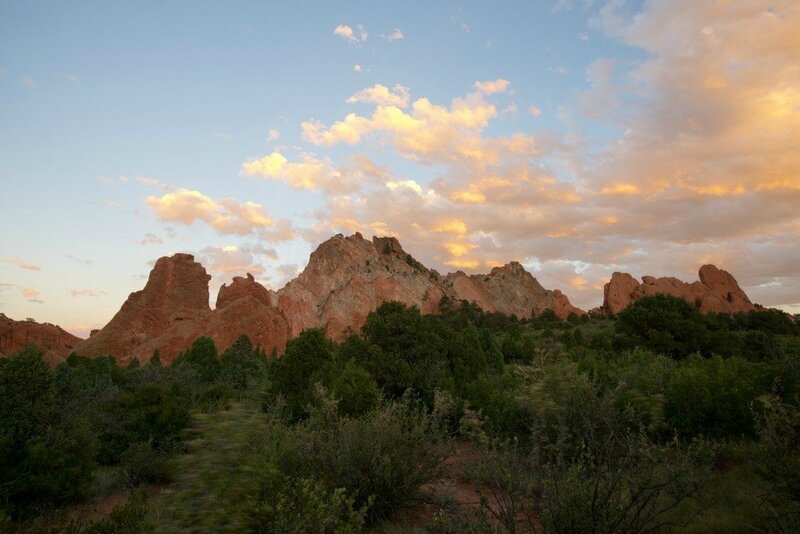 A visit to Colorado Springs can put a halt to the daily grind and help you rejuvenate yourself with a daily hike or climb. Imagine breathing in that crisp, cool mountain air as you hit the trails running, biking or taking a leisurely stroll. I can feel the fog lifting from my overworked mind just thinking about it. I don’t know about you, but I feel like it’s time to take my tired eyes off my computer screen and fill them with some natural beauty. Colorado Springs has incomparable beauty in every direction. It seems like I have been traveling nonstop lately. I know I could use a break, and nothing would help me hit the reset button like van camping in the shadow of the Rockies. For me, nothing helps me to re-center like spending some time in the great outdoors. And that time is even more special if I can convince my grown kids to tag along with my husband and me. Spending time with my family outdoors helps us reconnect on so many levels and is essential on long road trips. Since my kids were little, it has been our practice to break up our road trips with stops at local, state and national parks so we could stretch our legs and expend some energy. That one practice helped us keep the peace as we traversed thousands of miles. Colorado is one of the most memorable places we have traveled to as a family. And as my son gears up for another deployment, I’m thinking of where we can return as a family before he leaves. Colorado Springs would be a perfect fit. This may not be an outdoor attraction, but it is one of Colorado’s most visited, welcoming more than a million visitors a year. Since my son has been a member of the Air Guard for the past four years, it would be a natural fit for us to visit. 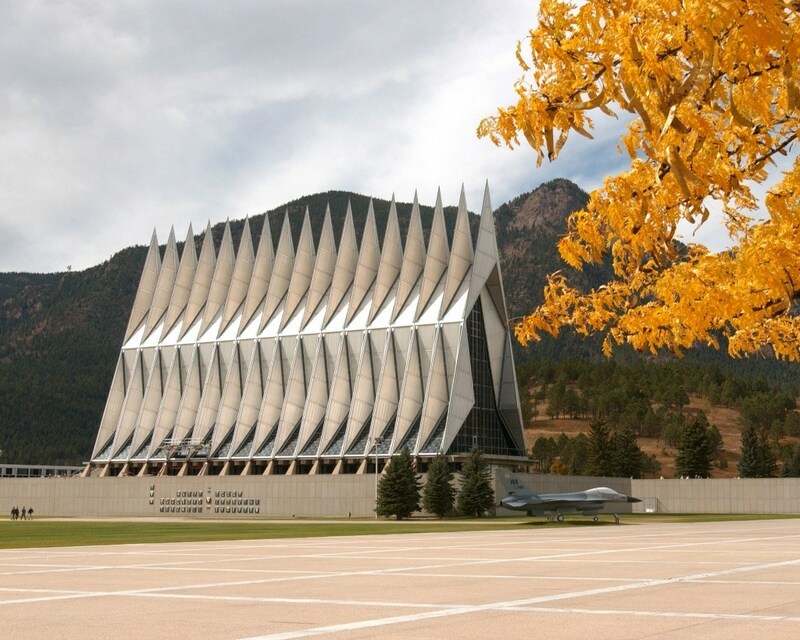 The main draw for me is the Air Force Academy Chapel which has been named one of CNN’s most epic churches in America. The impressive aluminum, glass and steel structure boasts 17 spires and contains a separate chapel for those of the Protestant, Catholic, Jewish and Buddhist faiths to worship. The US Air Force Academy is open daily to visitors can Chapel tours are often available. Visitors to the academy must enter through the North Gate which is accessible from Exit 156 on Interstate 25. Where do I start on this place? This amazing park is a photographer’s dream with its towering rock formations in various shades of white, orange and red, tucked against the mountains and juxtaposed against the white tops of Pikes Peak and the brilliant blue sky. My daughter and I could spend all day taking pictures. The views of the various rock formations throughout the park are unimaginable. Some not to miss formations include the Kissing Camels, Three Graces and Cathedral Spires, located in the Central Garden section of the park. It’s not MY cup of tea, but I can imagine my adrenaline junkie boys out there trying to tackle the toughest climbs. They would be grinning from ear to ear as they reached higher and higher. I would be biting my nails until their feet were back on the ground. On second thought, maybe this should be a trip that my husband and I take sans kids. Make sure to grab a full-color map of the park at the Visitor’s Center. The Visitor’s Center and Nature Center are chock full of informational and entertaining displays. If you plan to rock climb in the park, you will need a permit from the park. You can apply for one online or at the Visitor’s Center. I was disappointed to find out there is no camping inside the park, but there are nearby camp sites for those who are interested. Pikes Peak is the most visited mountain in the United States, and the second most visited in the world, following Mt. Fuji. 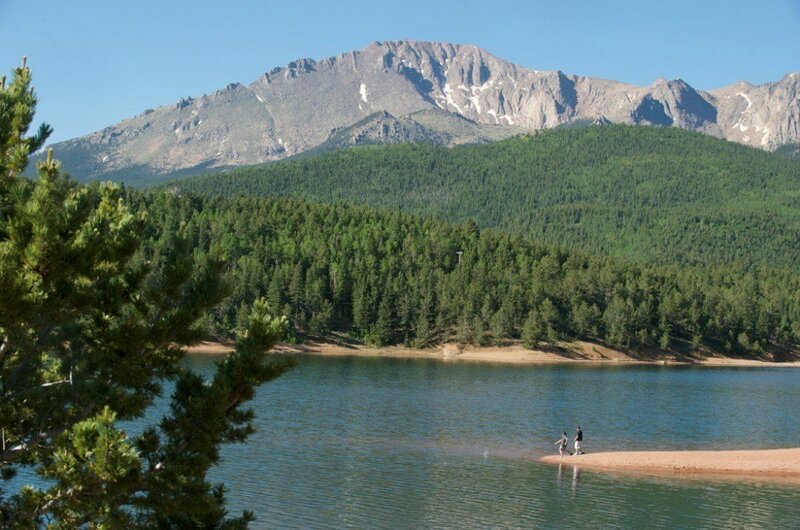 Pikes Peak is a “fourteener”, or a mountain that is more than 14,000 feet above sea level. It towers a whopping 8,000 feet above Pikes Peak Region, where Colorado Springs lies. If you want to see Colorado Springs from Pikes Peak, you’re going to have to choose how you want to make the trek up the mountain. Each has their own pros and cons, you can decide which choice best suits your family’s needs. 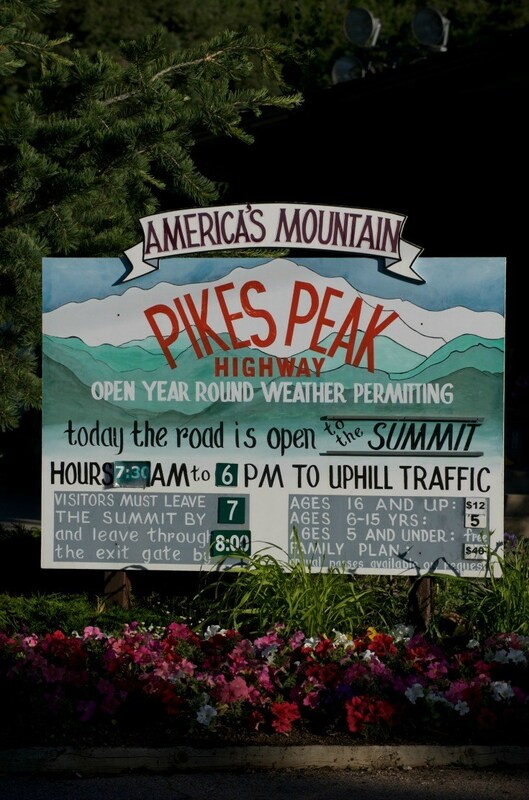 Keep in mind that access to Pikes Peak depends upon weather conditions. No one will be granted access if the weather conditions aren’t safe. The park has provided two options for you to check weather safety status prior to visiting. Pikes Peak has cameras in place for you to get a view of the weather conditions on the mountain. You can view current weather conditions by visiting https://parks.coloradosprings.gov. Current weather conditions are also pre-recorded on a dedicated phone line, updated 30 minutes prior to the park opening and then throughout the day if weather conditions change. The telephone number is 719-385-7325, choose option “1” to hear weather conditions. Pikes Peak is one of the most exciting sights you will ever see. Remember that the trip to the top and back will take a little over three hours. Make time in your schedule to allow for taking plenty of pictures, so you might want to add another hour or two to your plans. There are some important things to remember before heading up to the summit, no matter what method you choose to get to the top. Some may seem obvious, but they are important nonetheless. Be prepared for it. You will be traveling to a higher elevation, and at higher elevations, the air is thinner. Breathing becomes more difficult when you reach higher elevations which can lead to altitude sickness. Most people begin to feel the effects of high altitude sickness after about 30 minutes. Early warning signs include feeling a bit queasy or getting a headache. If you are ill or have young children with you, take extra precaution. They may feel the effects even sooner and taking the trip to the Peak might not be advisable. At any rate, be careful in budgeting your time so that you don’t put yourself or your family in a harmful situation. Since you will be traveling to such a high elevation, you should be prepared for dramatic changes in the weather. It is not uncommon for it to be a nice, balmy 75-degrees at the base of the mountain, only to have it be below freezing and icy at the top. Make sure you bring appropriate clothing. You may start off in shorts and then find yourself at the top wishing you had brought along your parka. I know it seems like a hassle, but in my opinion, better to be safe than sorry. Be mindful of your surroundings. You are traveling up a MOUNTAIN, watch your step. Watch those around you. It is easy to be caught up in getting the perfect photo of you and your bestie. Pay attention. These last two items shouldn’t have to be repeated, but unfortunately people forget or ignore these two crucial items. Hydration is vital no matter what situation you are in. Water evaporates faster in higher altitudes, making you get dehydrated even faster. The more dehydrated you are, the harder it is to breathe. Make sure you and your family are well hydrated before making the trek. Sunscreen, sunscreen, sunscreen. You’re at a higher altitude, and there is less of the earth’s atmosphere to block out harmful UV rays. It doesn’t matter what time of year it is, use your sunscreen. 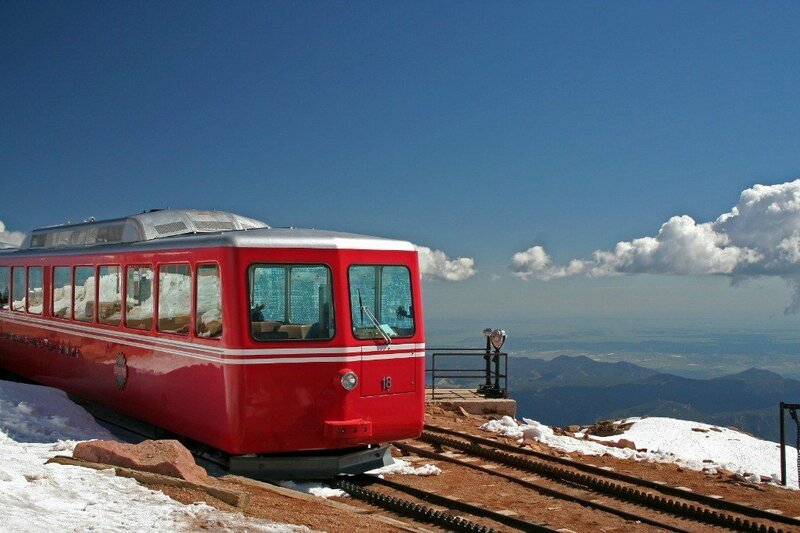 A favorite way to get to the summit is to take the Broadmoor Cog Railway train. It takes a big train to get up a big mountain, and the Broadmoor Cog train is the world’s highest cog train. The conductor is your tour guide and teacher, as they entertain and educate, pointing out items of interest allowing visitors to sit back, take in the view, and leave the “driving” to the experts. A word of advice, make sure everyone uses the bathroom before boarding the train. There are no restrooms on the trains (and no pit stops either). Driving your own vehicle to the summit is also an option. 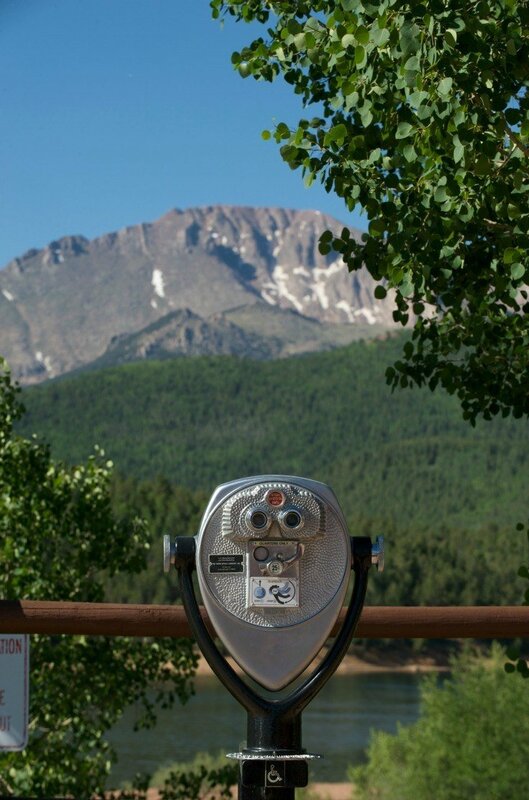 After you pass through the Pikes Peak Tollgate, a ranger will give you a map of the scenic 19-mile drive up to the top. Audio tours are also available at the tollgate. Adventures in Odyssey was a staple for my kids on road trips when they were young and I’m sure I’ll continue the tradition when I have grandchildren. How then, could I visit Colorado Springs and not opt for a self-guided tour of the Focus on the Family Campus with a stop at the Whit’s End Soda Shop? We all know what lengths I take to see roadside attractions so it’s only natural that I would opt to see the Herkimer, the World’s Largest Beetle. Built in the 1950’s, this giant West Indian Hercules Beetle has stood in this location since the 1960’s when it returned to its original location after a stint in Florida. Like many pieces of Roadside Americana, the beetle has seen better days but that won’t deter me from visiting and photographing it from every angle the surrounding barb-wire fence will allow. I believe in balance so all the outdoor time and van camping needs to be balanced with indoor time as well. My husband and I enjoy historic home tours and what better way to learn about the history of Colorado Springs than with a 90-minute Historical Tour at Glen Eyrie? Guests will learn of the heritage of General Palmer, the founder of Colorado Springs and the history of the area. Admire the unique architecture as you explore the Carriage House as well as the first and second floors with your guide. 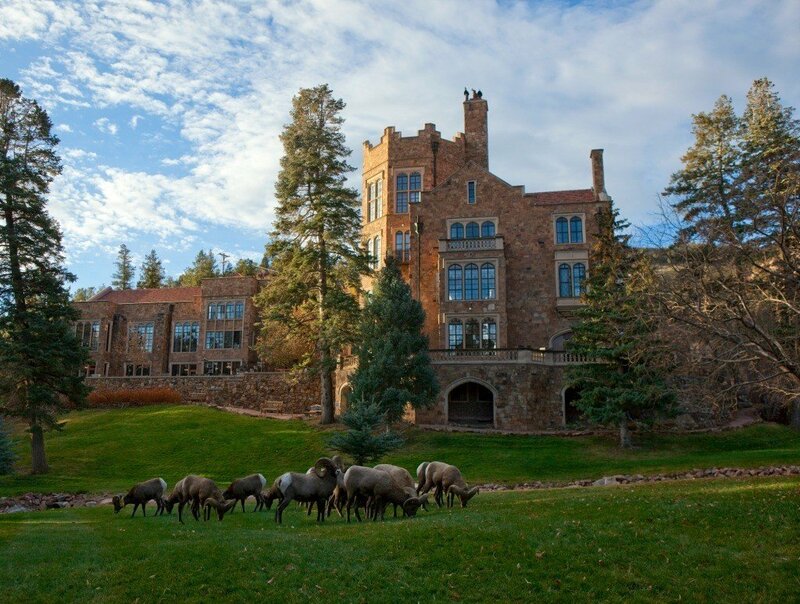 The Castle is now owned by the Navigators, a Christian organization, and houses their U.S. and International offices, the Glen Eyrie Conference Center and NavPress®, the publishing division of the ministry. I would enjoy the tour, but what I’d enjoy most is spending a night in one of the castle rooms. After all, one can only van camp for so many days before a hot shower beckons. There is so much more I’d love to see in and around Colorado Springs, that includes historic Manitou Springs and the cliff dwellings and the elegant Broadmoor. But if I only had a few days in the area, I’d start with the natural attractions which are too beautiful to miss. Would you like more information on Colorado Springs? You can view and download a free visitor guide to learn more about things to do in Colorado Springs. Have you been to Colorado Springs? What would you like to see? All photos used with the permission of the Colorado Springs CVB. Soooooo beautiful! No wonder Colorado Springs is on the Top 10 Up and Coming Travel Destinations list I read the other day! Thanks for sharing! I wish we lived closer! 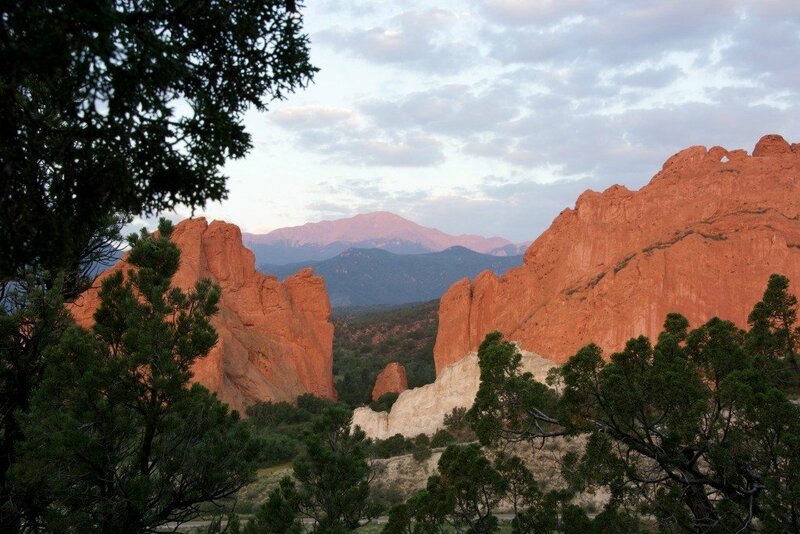 Colorado Springs is such a nature lover’s dream destination. I do believe we have it listed in our travel bucket list. I will have to check. If not, then I will add it and bump it up to the top of the list. Thanks for sharing the lovely, lovely photos. I didn’t even know there were castles in the US. I’d love to visit Colorado! There are actually several. Not like the historic castles in Europe but still castles. I’ve never been to Colorado Springs before, but it looks like a gorgeous place to visit! I would love to visit someday. We loved Pikes Peak when we went! Colorado Springs is a beautiful place especially if you love the outdoors. We are an outdoor loving family and my big kids can’t get enough of nature. Colorado Springs would be a perfect getaway for my active family. I think it would be so cool to visit Pike’s Peak. I would love to go to Colorado Springs one day. You and me both. I’m keeping my fingers crossed for a trip next summer. Colorado Springs is gorgeous! I haven’t been there since I was a teenager but I’d like to go back. All photos are really amazing and stunning! I’ll make sure to add this on my bucket list and bring my family soon. You did a great job with this recap. I have never been to Colorado but you mapped out great things to do there. I have never fully explore Colorado before! It looks so beautiful and it will allow you to appreciate nature more! I would love to go to these places. I have never been to Colorado Springs! OMG. It is so beautiful there. Nature sure works wonders to give us all that beauty to appreciate. I hope to be able to visit soon. Thanks for the virtual tour of the place. I hope you get there too! I agree with all these! Colorado Springs is really a must-see place! Love your gorgeous pictures! Colorado Springs has been on my list for a long time! The scenery there is breathtaking. I LOVE Colorado Springs. I try to find any excuse I can to be there. Sounds like you’ve visited quite a bit. What would you add to the list? There is so much to explore in Colorado Springs! I am one who loves outdoor adventures with my family, so this looks like the perfect travel destination for my family. Pikes Peak has been on my travel to-do list for some time. I do hope we can get there some day. Colorado Springs certainly looks like a great place to visit, so much scenery and things to do. I will have to add it to my bucket list of places to visit for sure! How amazing! I haven’t been to Colorado spring yet, but it looks like such an awesome place to spend a family vacation! Garden of the gods is so breathtaking, and my son would absolutely love the Broadmoor Cog Railway train. We will have to put this on our bucket list. I’m from Colorado and I definitely agree with these! If you enjoy the outdoors and love going to historical places, this is the place to be. It’s peaceful as well! I just love it here. We’ve been talking about visiting Colorado Springs for years, but we haven’t made it there yet. This list makes me want to put it at the top of the list! What a lovely post! I’ve never been to Colorado Springs, but your post sure makes me want to go. I wonder if they haver any good chocolate?? ?